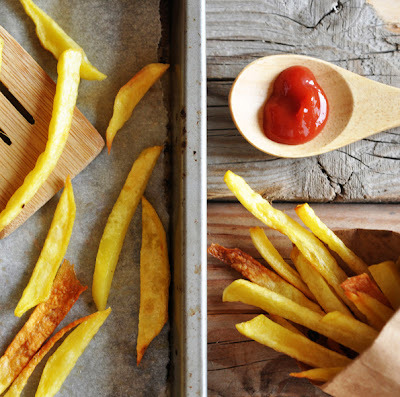 Have you ever checked the ingredients list of regular store-bought french fries? In the "best" case it only has gluten and sugar in it, in the worst case, the list is longer than my arm with all sorts of hydrogenated oils, additives and flavor enhancers that you can imagine. If they have any nutritional value left, it's probably gone after deep-frying them. Now, all children seem to be drawn to french fries. My kids are no exception. I admit they get french fries when we eat out, so the kids are happy and I can enjoy my meal in peace. But otherwise I avoid it. I remember, I once observed a mother trying to feed her 2-year old french fries on a playground. She was running after the kid, calling out to her: "Have some potato!" It made me cringe. Those french fries did not have much in common with potatoes anymore. Now here is a version of french fries that I am happy to serve my kids: Pure potato, no hidden extras, oven baked. The key is to cut the potatoes as thin and as even as possible. The rest does the oven and 30 minutes later you will have lovely crispy crunchy fries that are as healthy as can be. Those can still be called potatoes. We still treat them as a treat. The rather long cooking time doesn't allow us to cook them more often. Apart from that, potatoes have a rather high GI. But they are no. 17 of a list of foods with high amount of antioxidants. Who would have thought. Preheat oven to 200C/400F. Line baking sheet with parchment paper. Peel the potatoes. Then cut potatoes into small slices lengthwise, not thicker than 1/4 inch/ 5mm thick. Cut each slice into strips, no thicker than 1/4 inch / 5mm thick. Take your time while doing this, making sure that the fries are cut as even as possible. Spread fries onto the prepared baking sheet. Don't overcrowd. Sprinkle with salt. Bake for about 25-30 minutes, or until edges are crispy brown. Season with more salt if you like. Serve immediately.